Renate Laine and Marcus Rosano Arts & Humanities	 The Rockville Campus Art and Communication Arts Technology Departments feature two corresponding exhibitions running now through April 3. The twin shows are jointly titled "A Visual Feast" and feature works of art depicting food, related to food, or exhibits made from food. To spice up the experience, the two departments held opening receptions March 9. The Art Department's reception featured appetizers. The CAT reception offered desserts. Combined, the two shows involve 23 different artists and a variety of interesting, challenging themes. The Rockville Campus Art and Communication Arts Technology Departments feature two corresponding exhibitions running now through April 3. The twin shows are jointly titled "A Visual Feast" and feature works of art depicting food, related to food, or exhibits made from food. To spice up the experience, the two departments held opening receptions March 9. The Art Department's reception featured appetizers. The CAT reception offered desserts. Combined, the two shows involve 23 different artists and a variety of interesting, challenging themes. 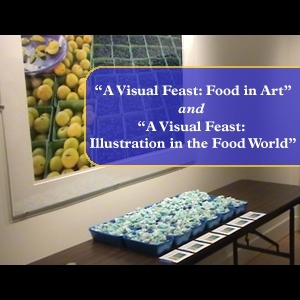 Embed ""A Visual, Moveable Feast" on Display at MC-Rockville" on your page.